Thailand cave rescue: How would you survive in a cave? 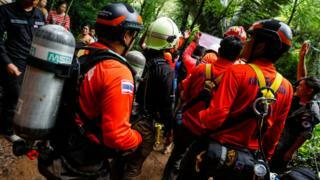 Heavy rain has flooded the cave system, hindering the authorities' attempts to go in and find them. They emphasised the need to keep warm and hydrated, and stay out of danger. Anmar Mirza, national co-ordinator of the US National Cave Rescue Commission, says the first thing to do is make sure you're not in any immediate danger. Rockfalls pose a risk, but the major worry is flooding. "You want to seek the highest point in the cave," Mr Mirza said. His advice is to try to guess where water had risen to in previous floods. "There's a number of ways to determine that point - look for mud, leaves, wet slime on the walls." "Wring out clothes to keep them dry," he says, "and huddle together for warmth." Andy Eavis, retired head of the British Caving Association, says thankfully hypothermia probably won't be a big issue in the Thai cave system. "The ambient temperatures will be fairly high," he says, estimating them to be between 23-26C (73-79F). Mr Eavis, 70, has been exploring caves for the past 50 years, including some in Thailand, Myanmar and China - although not the cave system in which the teenagers and their coach are trapped. He says many of these caves are huge - some big enough to be explored "with aeroplanes" - and doesn't think they're likely to flood to the roof. "If they're sitting out of the water, they won't die of hypothermia," he says. "We were there for 55 hours," he said. "But thankfully, we were wearing wetsuits." "Keep yourself hydrated, but beware of dirty water in the cave," Mr Mirza says. "It's a balancing act - diarrhoea and vomiting would make dehydration a bigger problem later." Even if the water is dirty, it won't pose an immediate problem, says Mr Eavis. "Most cave waters are reasonably drinkable," he says. "It might cause upset tummies though." "Little drips and inlets may have fresher water," he says. "But long term, food will be the problem." Mr Mirza agrees. "If you have food, make sure not to eat it all at once." Oxygen is also a factor. However, all three men agree that this isn't as big a concern as you'd think. "Most caves naturally breathe," Mr Mirza says. "Air can get in and out where people can't." Carbon dioxide levels can rise if people are trapped in such a small space for so long. But for the most part, the rescuers agree lack of air isn't a major problem. "In general, it's not uncommon for oxygen levels to be slightly low in caves," says Mr Whitehouse. "But not seriously low. It depends on the cave." "I always tell people it's a marmite sport," says Mr Whitehouse. "Underground is one of those places you're either happy or you're not." "Don't panic," says Mr Eavis. "Panicking and trying to get out come what may is the biggest risk." "The leader will have to really control them to stop them doing anything silly, like dive in," he said. "It's mentally very taxing being in the dark." "Experienced cavers will have hundreds of hours of light with them - modern LEDs, lithium batteries." "We're not talking about cavers here. They're probably not well equipped," says Mr Whitehouse. As a rule, if you're going to enter a cave, you should always be prepared, Mr Whitehouse says. "Get the right information, get the right kit, and go with someone who knows the cave," he says. "The earlier we get the callout the sooner something can be done," he says.